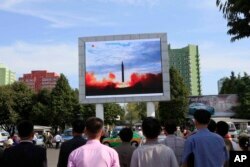 FILE - People watch a launching of a Hwasong-12 strategic ballistic rocket aired on a public TV screen at the Pyongyang Train Station in Pyongyang, North Korea, Sept. 16, 2017. FILE - South Koreans watch a TV news program showing North Korean leader Kim Jong Un's New Year's speech, at the Seoul Railway Station in Seoul, South Korea, Jan. 1, 2018. 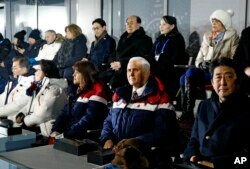 FILE - Vice President Mike Pence, second from bottom right, sits between second lady Karen Pence, third from from bottom left, and Japanese Prime Minister Shinzo Abe at the opening ceremony of the 2018 Winter Olympics in Pyeongchang, South Korea, Feb. 9, 2018. 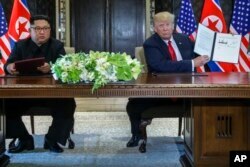 FILE - U.S. President Donald Trump holds up the document that he and North Korea leader Kim Jong Un had signed at the Capella resort on Sentosa Island, June 12, 2018, in Singapore. FILE - South Korean President Moon Jae-in and North Korean leader Kim Jong Un pose for photographs on the top of Mt. Paektu, North Korea, Sept. 20, 2018. 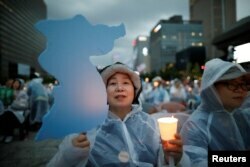 A woman holds a blue-colored cutout of the Korean Peninsula, symbolizing the unification of the two Koreas, during a candlelight vigil wishing for a successful summit between the U.S. and North Korea, in front of the U.S. embassy in Seoul, South Korea, June 9, 2018. 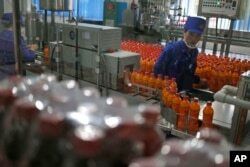 FILE - A worker monitors the production of bottled beverage at Songdowon General Foodstuffs Factory in Wonsan, North Korea, Oct. 22, 2018. Steve Miller is a veteran broadcast journalist with over a decade of experience. Much of that time he covered the Asia-Pacific region while living in South Korea. During Steve's time in Asia, he explored the region's rich history and culture (and not to mention food) while reporting on geopolitics, human rights, and tourism. Is Trump on ‘Strategic Patience’ Path?